On my first day at the new job, I noticed everything. I distinctly recall walking into the reception area for the first time, and seeing my name up on a easel with the word "welcome" next to it. I recall the pleasant smile of our receptionist, Marti and her warm and genuine greeting as if she had extended it to me hundreds of times before. I can remember how I looked at the lobby area differently as if I were inspecting the entryway of my new home. I absorbed every detail of the design and each nuance that my senses could detect. I took it all in, and of course this happened in micro seconds. Nearly a year later and that initial impression is just as significant to me now as it was on my first day on the job. How? Consider this. Every morning, I return to the office after a previous day’s work ready to begin the new work day. I may have worked late into the evening the previous night, or not—but in either case, walking into the lobby and being greeted by the receptionist helps set the tone for the day. And the design of the lobby makes a difference too. 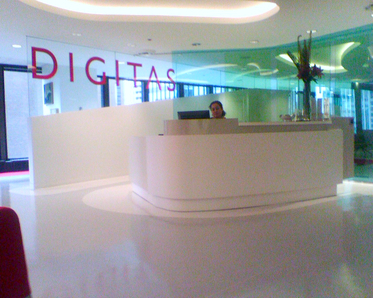 Sometimes I find myself thinking “I’m really lucky to work in such a cool looking office (with great people)”. I especially feel like this after traveling—and being exposed to a variety of other corporate environments. These experiences are no longer first impressions. And they matter. Walking into a positive office environment offers me reassurance that I’ve made the right career choice. Now, let’s bring this home. What kinds of everyday impressions is your brand offering up your customers? Think about the first time your customer interacted with the homepage of your site. How did it greet them? How did it welcome them? How did it help orient them so that they could move on to the rest of your site with confidence? Now fast-forward a year later. Your customers have seen your homepage many times before. It’s nothing new. What are you doing to reassure them, that they have made the right choice to business with you? Are you doing things that make them feel “lucky” to be in a relationship with you? Do they feel appreciative of you—especially when they have had experiences with other brands? Has their positive first impression evolved into an equally everyday impression? T-Mobile does this for me. A while back, I reviewed their homepage and discussed why I thought it was so successful—especially to the first time visitor. 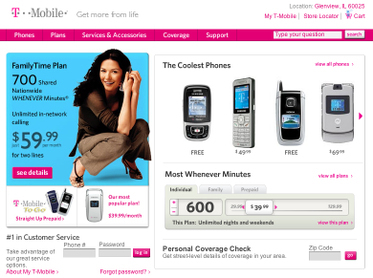 But as a seven-year customer of T-Mobile, I still enjoy the everyday impression I have with this design. There isn’t actually a lot for me to do on the homepage (except log-in), but for some reason I feel good about seeing starting here. I like knowing about their latest phones and plans. I just like that it’s “there”—even if I don’t use it. For some reason, I find it reassuring that I’m giving my time and money to a brand that I feel good about. Back to the lobby example. When I was working during the the dot-com days, we traded in standard titles for namesakes such as “Director of First Impressions”. Makes me wonder... Is it really about being a “Director of Everyday Impressions”?